Villa Istria sits on a corner site of a small modern development in the village of Montizana which is 4 miles from the Adriatic resorts of Porec, Funtana and Vrsar. It has substantial grounds of 457 square metres. From the poolside it enjoys panoramic views to the sea to the Adriatic to the west and the Dolomites and Alps to the north. It is fully equipped for up to 6 people. THe gardens are 100% private and are fully surrounded by fences and hedges of 1.5m tall. The villa is built to a very high standard with fully tiled floors throughout and good quality furniture and equipment. It has heating for winter and fans for summer. The villa has been recently upgraded with air-conditioning, new shower, dishwasher and large screen tv and has been fully redecorated throughout. We provide internet access from 1 April to 30 September each year. My wife Louise and I always went to different places for our holidays. But, when we went to Porec in 2004, we fell in love with the area and bought Villa Istria in 2005. We loved the area and had the opportunity to buy early on this development to get the best site. We bought before it was completed so we could get the villa with the best views and choose the internal finishes. We enjoy a holiday where we can have some peace and quiet but not have to drive too far to visit the beaches and restaurants. We cook in some times and go out others. Just at the coast is the Zelena Laguna complex where there is a huge range of sporting activities. We also own some prime land in a nearby village Kadumi and we are holding this as a further development and investment opportunity. Montizana is a small rural village and we love it when the local chickens wander over to pay us a visit or the donkeys or sheep are out to see. If you go up the hill behind our house, you can climb a fireman's watchtower and see the beautiful countryside of Istria for many miles around. Our pool is cut into the hillside so is very private with no-one overlooking it. Ideal to relax. In the height of summer, Montizana usually about 3-4 degrees cooler that the temperature at the coast which can be welcome when temperatures peak. The Montizana sky is wonderful at night - well worth putting off the lights and just gazing at the sky to see it without light pollution. Many children have never see a sky like this before if they are city dwellers. Bathroom 1 has wc, sink, shower and washing machine. Bathroom 2 has wc, sink and shower. Parking within gates in driveway area. Yes (not beach towels). Changed weekly. Spacious lounge with double sofa bed, occasional furniture and satellite TV. From the lounge is a patio door to the terrace and barbeque. Fish, pasta, meat dishes and utensils. Bread bin, chopping boards, large knives. Kitchen with hob, oven, fridge/freezer, microwave and grill, electric kettle, toaster, coffee maker and dishwasher. Full dining table seats 6. 40 inch TV. UK and European channels available. Range of dvds to suit children and family entertainment purposes. Patio and poolside terrace area with beautiful views to the sea, valley and mountains. Excellent local hotels such as Diamant and Parentium provide indoor saunas and steam rooms. Not available on site. 6.5 * 3.5 meter pool in secluded area of garden with surrounding patio area with shaded swing seat and sunbeds. Excellent local hotels such as Diamant and Parentium provide indoor pools. Not available on site. Notes on accommodation: We supply plastic glasses for children and use at the pool. Outside: The villa has a private pool size 6.5m x 3.5m. Maximum depth 1.4 m. All around the pool is a substantial terrace affording plenty room for the 6 sunloungers. There is a separate area with a barbeque. Utility Room: Iron, ironing board, dryer. Cleaning / Towels / Linen / Maid service: Bed linen and towels are supplied and will be changed weekly. Maid service is also weekly. There is a washing machine and line dryer for your convenience. The villa had everything we needed which made it ideal from our perspective. The secluded and peaceful location suited us for rest and relaxation during the day and at night we could easily drive to Porec for more liveliness - it was a great combination for us as we wanted the best of both worlds during out holiday. The private pool, not overlooked by anyone, was a real bonus (and essential during the August heat) although the wasps were a bit of a pest as they seemed to come out of the lavender around the pool as soon as we got in! The owners have thoughtfully provided a wide range of equipment including books and useful information about the area. We would definitely come back though perhaps at a different time of year as it was extremely hot in August. Alles war gut gerne kommen wir wieder. Nette kleine Villa ausreichend Platz für 4 Personen. Schade nur das es hier im Ort selbst nicht die Möglichkeit gibt einzukaufen (Lebensmittel). Nach Porec sind es ca. 9 km und mit dem Pkw in 20 Minuten zu erreichen,dort gibt es dann auch genug Möglichkeiten einzukaufen,oder ans Meer zu fahren. 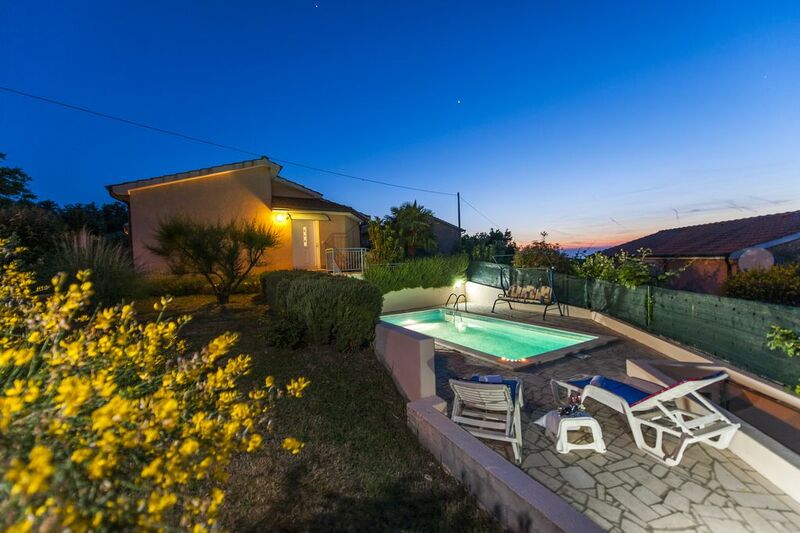 Nice villa with a private pool area and fenced garden perfect for our dogs. Entfernung nur 5 bis 15 Minuten kam uns sehr entgegen. Die Aussicht durch die leicht erhöhte Lage, der uneinsehbare Garten und Pool und die Ruhe waren einmalig. Während der WM keine deutschen Sender empfangen konnten. Wir haben den Aufenthalt trotzdem genossen und werden gerne wieder kommen. The area is characterised by charming bays with small beaches mostly lined by trees which provide shade. Villa Istria is 4 miles from the coast to Porec, Funtana and Vrsar. The Zelena (Green) and Plava (Blue) Lagunas (6 minutes drive) on the coast have a full range of sports available including watersports, horse riding, tennis, football and many other sports. Cycling is very popular and Montizana is on the local cycle route. Nearest airport is Pula 40 minutes . Trieste (2 hours), Venice (3 hours), Riyeka (1.5 hours) and Llubliana (2.5 hours). We will provide directions and a map of the area. Villa Istria is on the edge of the tranquil village of Montizana. Groceries are available at the Zbandaj 2 KM away. there are many good supermarkets near Porec or Vrsar within a few minutes drive. There are many charming small villages within a 10 minute drive and a multitude of good qualty restuarants which are very reasonably priced. A family of 4 can eat well with a couple of drinks for under £30. The Istria area has numerous places of interest including the Roman amphitheatre at Pula, the basilica at Porec and towns such as Rovinj and Motovoun. Booking Notes: Deposit 20% on booking with balance 4 weeks prior to entry. Changeover Day: Flights are often cheaper in mid week and mid week changeovers can be accommodated by arrangement, especially out of main season. Arrival time 4.00pm Departure time 10.00am Notes on prices: Prices are for the property per week in UK Pounds. A charge will be made for electricity usage during winter months. We are willing to discuss discounts for low season rentals.